Wolfs' Books: Different Bible Translations... What's With That? If you've visited the About Me page on this blog you'll know that I've trained and worked as a Christian pastor and also worked in a Christian book store. One of the favourite parts of my job in the book shop was selling (and purchasing) the Bibles. Because of this I have people approach me in regards to Bible related subjects. One is a question about all the different Bible translations out there. In recent times it does seem like there is a Bible tailored for everyone. Men's Bible, Women's Bible, Boy's Bible, Sport's Bibles, Study Bibles, Archaeology Study Bible. 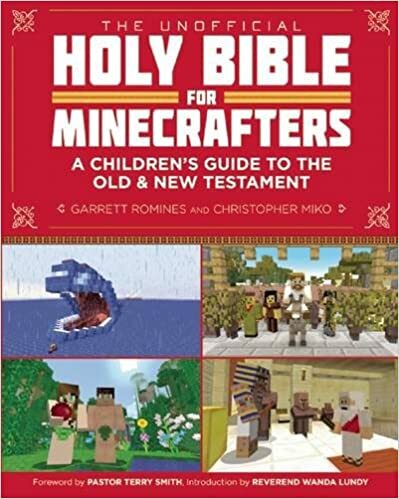 The Bible for Men Who Love Playing Minecraft, etc. I've actually had people tell me that the only Bible we should be using is the one that 'Jesus gave to his disciples' and that we shouldn't bother with any other translations. They are normally always referring to a translation called the King James Version (KJV). If Jesus did give His disciples any written manuscript it won't have been in a version of English that would not be spoken for another 16 hundred years in the future (1611), which is similar to the English we hear in Shakespeare's plays. The Old Testament was written primarily in Hebrew with small parts being written in Aramaic. The New Testament was originally written in Greek. Therefore, all English Bibles are in fact translations of the original languages. When it comes to Bible translation there are 3 different ways of doing it. First there is Formal Equivalence or Word for Word. This translations attempts to keep the exact words and phrases of the original. They are fairly faithful to the original text, however they are sometimes hard to understand. Next is the Dynamic Equivalent translation or Thought for Thought. This translation attempts to stay true to the history and facts of the original but changes the writing style and grammar in order that modern readers can understand the thoughts behind what the original meant. Lastly there is a translation which attempts to get a balance between Word for Word and Thought for Thought. 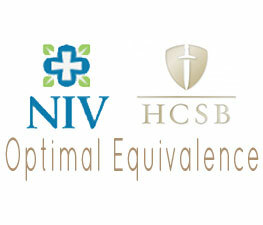 Sometimes called Optimal Equivalence. If you want a Bible for simple devotions, then I would suggest going with a Dynamic Equivalent, or a Though for Though translation. One that will be easy to read and understand, one that will flow when you read the passage. Two translations that I would recommend for this type of activity are the Contemporary English Version (CEV) or New Living Translation (NLT). The CEV would be better for Children and the NLT for teens and adults. 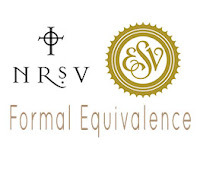 If you want a Bible for deeper studies, for use in Growth groups, Adult Sunday Schools or Bible college study then I would suggest going with a Formal Equivalence, or Word for Word translation. The passages and prose may not flow so well for English readers but the words used should be the closest English equivalent of the original language. 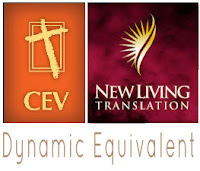 Two translations that I would recommend for these activities are the New Revised Standard Version (NRSV) or the English Standard Version (ESV). * However it would be best to consult the institution you are studying with as to what they would prefer you to use. Finally if you want one for both of the above tasks, daily devotions and light study then grab one which is a balance between word-for-word and thought-for-thought, or Optimal Equivalence. These will be translated to give a good flow in prose but still try to get a decently direct translation from the original language. Two translations from this group that I would recommend are the New International Version (NIV) or the Holman Christian Standard Bible (HCSB). What about the Kings James Version (KJV)? The KJV is not one that I would generally recommend anymore as it's difficult for modern readers to understand. The KJV is a timeless treasure and was the first Bible translation that I owned. It belongs to the Formal Equivalence family of translations. It was one of the first English translations of the Bible and it's purpose in translation was “to deliver God’s book unto God’s people in a tongue which they can understand.” It was first published in 1611 and hasn't changed much since then, the version we all know and love today is actually the 1769 version which standarised the language. 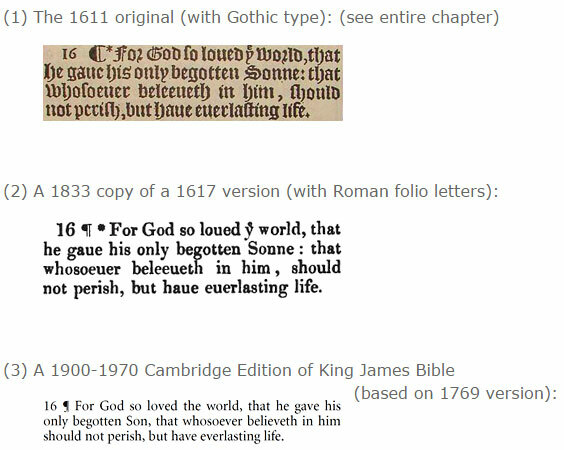 The image below shows the language differences for John 3:16 between the major changes with the KJV.